My grandparents, Norman and Mary Litvak, founded the Santa Monica Homeopathic Pharmacy back in 1944, originally planning on selling the usual items found in drug stores at the time—medicine, alcohol, soda, cigarettes. Little did they know that within just a few years, they would be pioneering the first fully integrative retail pharmacy in the United States. Norman had been trained as a pharmacist at the University of Buffalo and understood the side effects of medication and the nutritional deficiencies caused by them. When the pharmacy’s customers weren’t doing as well as he and Mary had hoped, they decided they should provide customers with education and other alternative methods of healing, even though it was far more profitable to sell just prescription drugs. When a homeopathic sales rep entered their store shortly after purchasing, they were intrigued and decided to see what would happen if they offered these remedies to their customers. When customers came in with allergies or aches and pains, Norman started giving them a homeopathic remedy instead of a drug. After those customers ran out of remedies, they came back for more. Complaints about side effects went down. Customers had fewer symptoms or were symptom-free. As word spread, many local doctors and individuals came to inquire about alternative ways of treating their ailments. Norman and Mary’s passion for homeopathy was contagious. My grandfather formed relationships with doctors in the community, and even took some M.D.s under his wing, teaching them the homeopathic trade. A form of treatment that used to be considered snake oil or a placebo remedy proved to be an effective, non-invasive approach to a wide range of health issues. Homeopathy is a system of medicine founded in the early 19th century by German physician Samuel Christian Hahnemann, who claimed that the medicine he had been taught to practice sometimes did patients more harm than good. The word “homeopathy” comes from the Greek words homeo (“similar”) and pathos (“suffering”). It is based on the principle that a disease can be cured by smaller doses of a medicine that, at full strength, creates similar symptoms to what the patient is experiencing. Modern medicine often addresses a single symptom and not the totality of symptoms, whereas homeopathic physicians take into account all symptoms, including how the patient is reacting to the symptoms. Modern medicine is based on killing, suppressing, or blocking symptoms. Homeopathy works by allowing the body to handle the symptoms and then restoring balance. For example, to treat allergies, a conventional pharmacist likely will dispense an antihistamine like Claritin or Zyrtec in which the active ingredient is designed to calm down your body’s immune reaction to allergens like pollen or animal dander. A homeopath, however, might prescribe Histaminum 15C, a remedy that is made from purified chemicals called histidines, which come from living substances, such as plants. Rather than blocking the action of histamine, one of the body’s natural chemicals, as a conventional allergy medicine would, this homeopathic remedy works by gently helping our immune system reduce the histamine load on the body without any drowsiness. Most patients notice a difference in their symptoms within the first 10 to 15 minutes after taking the remedy. All homeopathic remedies are derived from plants, minerals, and animal sources and are prepared in minute dosages. They can be used during pregnancy and breastfeeding; they don’t react with other medications and substances like alcohol. Homeopathic remedies can be dissolved in water for animals and babies, and most have a pleasant taste, so children accept them with ease. There are limits, of course, to what homeopathic medicine can do—Homeopathy alone is not for life-threatening emergency situations. It can be used for the side effects of chemotherapy or radiation, but not alone for cancer. Serious health disorders need to use multiple approaches to get the best results. But we have found that homeopathy and other alternative medicine work well for chronic diseases and certain diseases where there are no modern treatments available. There are many misconceptions about homeopathic medicine, including that it’s merely a placebo therapy. But infants, children and animals—living beings who can’t “overthink” themselves well—get results from using our remedies. And, scientific double-blind randomized clinical trials, many of which have been recorded and repeated, also prove homeopathic medicine’s effectiveness. A few years ago, the Swiss government affirmed that homeopathic medicine works and is safe to consume. 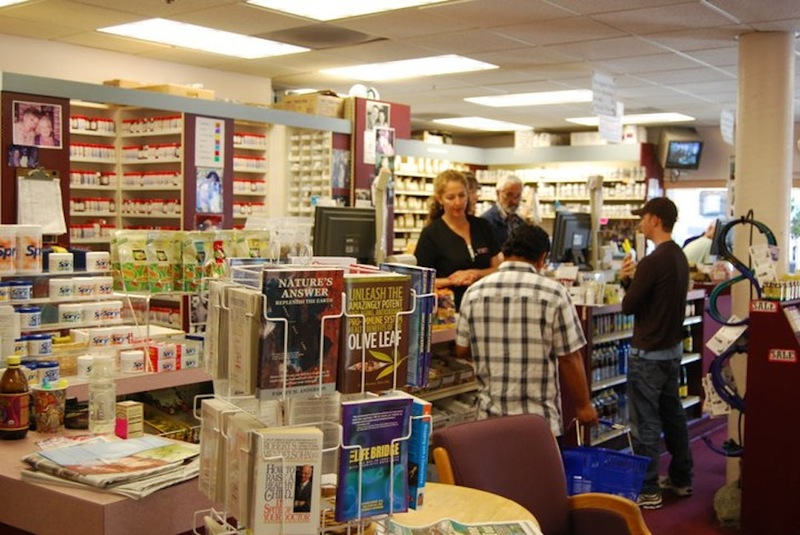 One misconception about our pharmacy, especially from first-time customers, is to assume that everything in our store is homeopathic. However, we are a completely integrated pharmacy and also offer a few safe prescription medications. It’s just that we have more than one option for treating illness. “Alternative medicine” is an umbrella term used to describe many of the health sciences that are not classified as modern mainstream medicine. Homeopathy is only one of the sciences that falls under alternative medicine. We also offer flower essences (commonly used for emotional problems), Western and Chinese herbs, professional nutritional supplements, essential oils, and natural skin care and household products. Such controversy belies the consistency with which we have run our pharmacy for almost a century. At any given time during business hours, Monday through Saturday, people enter our doors knowing that they can have a free consultation with any of our staff members, all of whom have been trained and certified in a field such as homeopathy, herbology, acupuncture, pharmacology, and nutrition. We also have pharmacists on staff who have received conventional training. Over the years, our store has definitely changed. The name evolved (from Santa Monica Drug Company to Santa Monica Homeopathic Pharmacy). Cash registers were replaced by computers. Candy and soda was replaced by healthy snacks and beverages that do not cause sugar spikes in the blood and other negative effects on the body. Cigarettes and alcoholic beverages are long gone. The clients have come to ask more about alternative medicines. And we now have hundreds of medical doctors and hospitals that send their patients into the pharmacy to get help. Alternative medicine for many has become their medicine of choice. 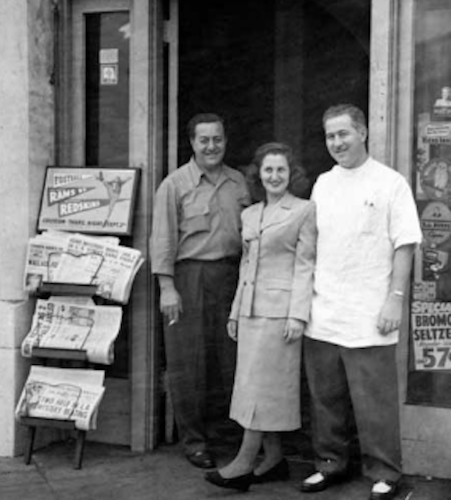 When Mary and Norm opened the pharmacy in 1944, their sons were 4 and 7 years old. Santa Monica was a center of aerospace manufacturing. Bub and Pop could never have imagined that their small, family-owned pharmacy would still be in existence so far into the future, or that the city where it was based would become an upscale tourist destination. But they would recognize that, just as they did, two more generations are continuing to find the best ways to cure what ails their customers, no matter what tradition the treatments might come from. Steven Litvak wrote this article with the help of family members Kimberly Litvak, Robert Litvak and Donald Litvak, who also work at the pharmacy. He wrote this for Thinking L.A., a partnership of UCLA and Zócalo Public Square. Primary Editor: Alexis Hauk. Secondary Editor: Sarah Rothbard. *Photos courtesy of Steven Litvak. alternative medicine, business, California, family, pharmacy, Santa Monica, Thinking L.A.